God Bless America stitch count 105w x 49h, approximately 7 1/2" x 3 1/2" on 14ct. Relax stitch count 50w x 71h, approximately 3 1/2" x 5" on 14ct. You Are The Light stitch count 51w x 161h, approximately 3 3/4" x 11 1/2" on 14ct. Hello Spring stitch count 51w x 49h, approximately 3 3/4" x 3 1/2" on 14ct. Sunnyside Mason Jar stitch count 97w x 133h, approximately 7" x 9 1/2" on 14ct. 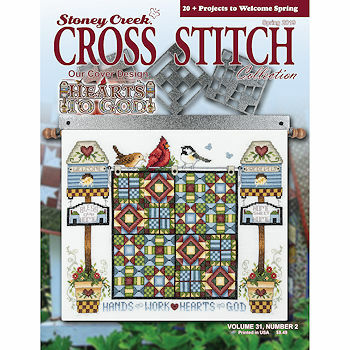 Welcome Summer Truck stitch count 114w x 101h, approximately 8 1/4" x 7 1/4" on 14ct. Faith & Fear stitch count 103w x 129h, approximately 7 1/4" x 9 1/4" on 14ct. Life On The Farm stitch count 157w x 121h, approximately 11 1/4" x 8 3/4" on 14ct. Stitched By Me Sampler stitch count 41w x 153h, approximately 2 1/2" x 9 1/2" on 14ct. Hearts To God stitch count 179w x 144h, approximately 12 3/4" x 10 1/4" on 14ct. Graduation 2019 stitch count 90w x 64h, approximately 6 1/2" x 4 1/2" on 14ct. Dad's Light stitch count 63w x 91h, approximately 4 1/2" x 6 1/2" on 14ct. You Gave Me Wings stitch count 63w x 91h, approximately 4 1/2" x 6 1/2" on 14ct. Two Hearts~One Love stitch count 63w x 91h, approximately 4 1/2" x 6 1/2" on 14ct. Beachy Towels stitch counts 100w x 36h and 102w x 36h, approximately 7 1/4" x 2 1/2" on 14ct. Beach Heaven stitch count 190w x 110h, approximately 13 1/2" x 7 3/4" on 14ct. Divisions of Nature Series - Summer stitch count 150w x 38h, approximately 10 3/4" x 2 3/4" on 14ct.